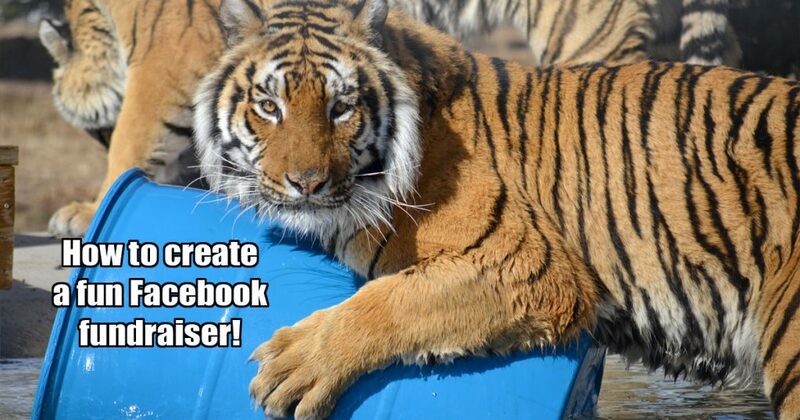 How to create a fun Facebook fundraiser to help big cats in need! Home » How to create a Facebook fundraiser so your friends can help, too! Have you heard of this new way to celebrate a birthday, anniversary, or special occasion in your life? Or a way you’d like to memorialize or honor someone (human or pet)? Now, it’s really simple to create your very own customized fundraiser on your Facebook page! 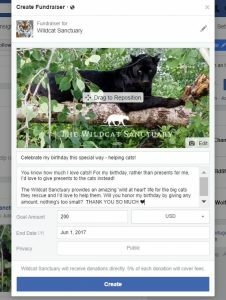 It’s an amazing way to help support the cats at The Wildcat Sanctuary. And after all, who needs presents more than all these rescued wild cats to make life fun? The new FUNDRAISERS section is right near the top of our home page. Simply click on the blue button +CREATE and you’re ready to get started! You can call your fundraiser anything you’d like and write up a description, choose your goal, set an end date and that’s it. The next screen that pops up will allow you to choose who to share this fundraiser with – certain groups you’re in, certain friends, etc. It’s completely up to you. 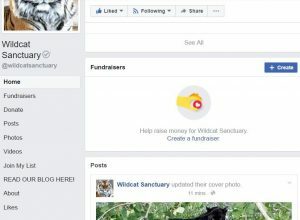 And, your fundraiser will be featured at the top of The Wildcat Sanctuary’s page, too! Search for a nonprofit, then choose a cover photo and fill in the fundraiser details. Please be sure to email us at advocacy@wildcatsanctuary.org if you have any questions or would like to share your ideas and success! Thank you for helping us say “YES!” to so many in need! !